Review Summary: It is a case of perfect casting and a very 'Bollywood' solution to the youthful restlessness. 'Dear Zindagi' keeps things interesting through its running time with charming performances. For two hours you put up with too shiny, too happy people holding hands and you're fed up with the hokey counseling sessions. The last half hour actually touches you but it is too little too late. So Dear Zindagi is a bumpy ride but, all things considered, it’s still one worth taking — especially for the sheer pleasure of watching Alia soar. Dear Zindagi' is a half-hearted soulful film. It starts on a tediously boring note and after a whiles gets on its right but perfect track. Watch ‘Dear Zindagi’, for the beauty of subtlety, for its insight into contemporary relationships and to understand that talking to a therapist can be as simple as trying to get some sleep. There’s no shame in seeking help for emotional issues, just like we do for physical ailments. Not just a relationship saga, here's why Dear Zindagi is easily one of the finest gender-bender films in Bollywood! Feisty Alia, one of the better actors of the current generation, turns in a nicely nuanced performance. And SRK in his sober-avatar possessing infinite gyaan tempts you to seek out a therapist. If you’re in the mood to do some soul-searching this weekend, this film could do it for you. In fact, she can barely make telephone conversations with them. A little bit of trimming would have made it a better, but still the movie is a good ‘soul-searching’ exercise. Some Over-The-Counter Remedy For Matters Of The Heart! Diligently crafted and emotionally engaging, Gauri Shinde's Dear Zindagi is a sparkling little gem with a big heart. Shah Rukh Khan shines as her dishy therapist given to dispensing WhatsApp-style wisdom. We have seen Imtiaz Ali and Aamir Khan deal with the same topic in Tamasha and Taare Zameen Par, but Gauri Shinde gives it her signature and links it rather well with romance. It’s painfully slow but has some beautiful moments. Definitely makes for a good one-time watch! Dear Zindagi starts off on an intriguing note, but slowly turns into an endless talk show. Last but not least, the choice of southern Goa as the backdrop for Kaira’s slow healing is a cinematographic victory. Particularly breathtaking are the shots of Bhatt and Khan strolling along on an empty beach – the kind of location that is usually home to Bollywood dance sequences. There is hope yet. Four years after her much-appreciated debut with English Vinglish, filmmaker Gauri Shinde is back with another female protagonist-centred story that aims to unsettle cliches in our judgemental society. 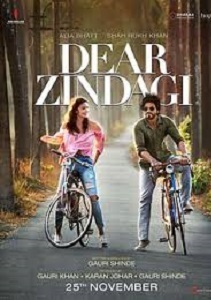 Dear Zindagi” might not be a love letter to life it was intended to be, but Bhatt and Khan make this one worth watching. SRK-Alia's chattathon is a party that ends up as a jagrata! More Powerful Thought, Less Powerful Story! Alia Bhatt is the HERO and Shah Rukh Khan complements her beautifully!